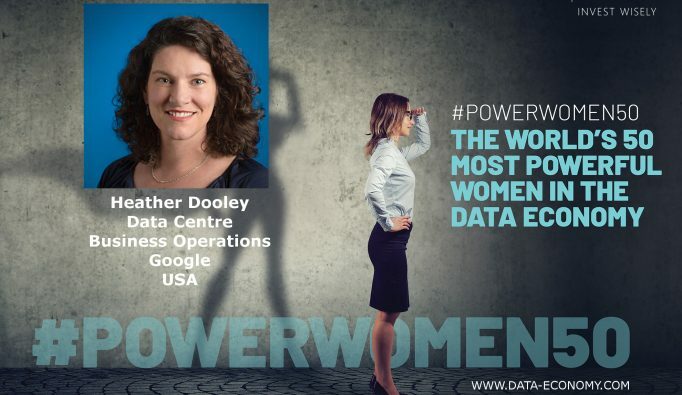 Data Economy has an article on the 50 power women in the data economy. My first inclination was to look for people and/or companies I think of in leadership positions and have been presenting at data center conferences. Two Google execs - Heather Dooley and Sarah Clatterbuck. Two Facebook execs - Delfina Elberly and Rachel Peterson. Microsoft exec - Julie White. Going through the article it was nice to see others who made the list and their background. if you click on a person you get more information. Like Heather Dooley’s background. With over 20 years of experience, Dooley has invested most of her time in helping to build out the internet as we know it. She is a key team member within Google’s data centre expansion board and has a strong say on the company’s long term and strategic advancements of its cloud infrastructure. She also leads Google’s program management for metrics and analytics, new products, documentation, and communications. Prior to joining Google, Dooley has also worked at other giants including Microsoft and Earthlink. She is also an advocate for gender equality and is actively always pursuing ways to open new doors of opportunities for women in tech and is a member of 7×24 Exchange Women in Mission Critical Operations Committee (WiMCO). 7x24 Exchange’s President David Schirmacher has passed. It is with profound sadness that I share the news of the passing of the President of 7×24 Exchange International, David Schirmacher on January 30th after a recent accident. We are deeply saddened by this tremendous loss. We extend our deepest sympathies to David’s wife Veronica, his brother Axel, his family and friends. I have had so many hours of conversations with David I don’t know what to write. Yet I have written so many times about conversations with David. Writing about the end of conversations is so much harder. One of the last conversations I had with David is his new data center metrics. Without David’s thought leadership the metrics will fade, but my memories of David will not. I can hear his voice in my head. I can hear his laugh. His quick wit. Hearing about David’s passing I immediately thought of his wife Veronica who is an empty house. David’s presence was always a pleasure and I cannot imagine how Veronica feels in her house now. When attending 7x24 I got in the habit of staying after the Wednesday presentations to have a burger with David by the pool. David was always busy at 7x24 and the time to chat with him would be after the conference was over. It is hard to accept I’ll never have another burger with David. I wish i could write more, but it is so hard. It is hard because it hurts to think David is gone. David will be missed my many. In 2016, Uptime Institute announced that Lee Kirby was President. Thanks to friends, I heard 2 weeks ago Lee will be retiring from Uptime. And we were both on the flight to SEA to PHX on Sunday to 7x24 Exchange and Lee told me in person he has retired, And the written proof is Lee Kirby’s LinkedIn profile, showing Lee only job is Chairman of Salute, inc.
Congratulations to Lee Kirby! A bunch of us will get together on Tues to celebrate Lee’s retirement. Also went to Uptime Institute’s website. Did not see any press announcements, if you look at the uptime institute team there is no mention of Lee Kirby. I've known Bill Hunter since his days at AT&T, then Disney, then Amazon. We would keep in touch socially and most of time stay away from company talk especially when he worked for Amazon. 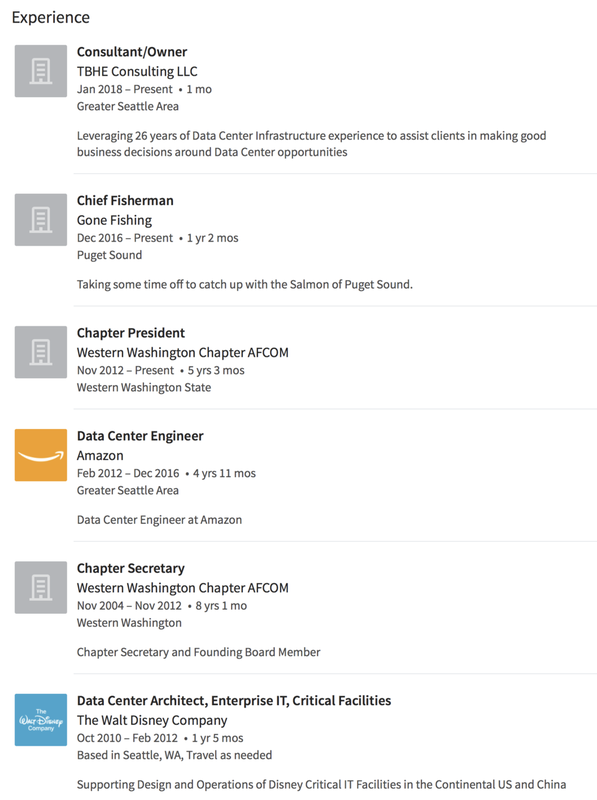 In 2016, Bill left AWS after 5 years and he changed his LinkedIn profile to Chief Fisherman and "gone fishing." Today Bill updated his LinkedIn profile to Consultant/Owner, "TBHE Consulting LLC." Bill and I are both in the Seattle area and we chat about the industry much more often now that he isn't traveling the world for whatever he was doing at AWS. Know many of you have been asking what Bill is going to do when he left AWS. Now you can contact him on LinkedIn. “Lymphatic filariasis is one of the worst of these diseases. It’s caused by a parasite that’s spread by mosquitoes, and in the severest cases people may develop swollen limbs, a thickening of the skin known as elephantiasis, or other severe disfigurements. Beyond the pain and disabilities they experience, people affected by the disease are often ostracized by their communities and are unable to work, sinking them deeper into poverty. At the end of the blog post Bill shares the secret to success. For so many of the systems I have worked on I focus on the “trust.” As trust increases everything works better. Without trust everything gets harder.